At Cedar Crest Farm we offer comprehensive training in the three traditional disciplines of dressage, show-jumping and eventing. Our aim is to get the best out of each horse and rider using tried and trusted schooling methods. Whether the ultimate goal is to event or show-jump, to fox hunt or compete in pure dressage, our staff have the in-depth knowledge to assist each rider in achieving their ambitions. From the very first lesson when horse and rider are professionally assessed we concentrate on helping the rider acquire a balanced, stable position. Once this has been established our innovative approach to teaching helps riders make rapid progress both on the flat and over fences. 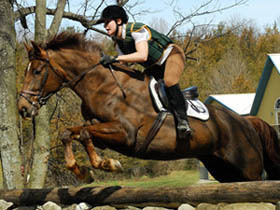 Safety is paramount, as is a respect for the physical capabilities of both horse and rider. Our instructors are certified by the B.H.S. as teachers and have been trained in the art of communicating the skills of riding. First-time visitors are always impressed by the amount of new information they receive. Instead of the popular one-size-fits-all approach of heels down and chin up each lesson is constructed to the needs of the individual. 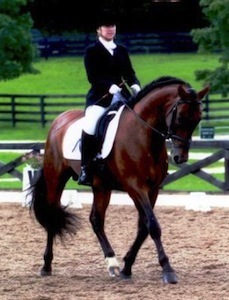 Clients can take private, semi-private or group lessons in flatwork, jumping or cross-country. We also offer theory lessons for those interested in increasing their overall knowledge of horsemanship following syllabi set by the British Horse Society in their Progressive Riding Tests. 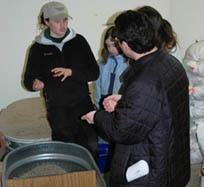 Topics covered include such diverse subjects as first aid, lungeing, trimming, tack fitting and horse psychology. 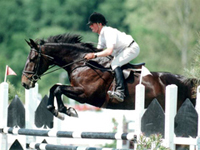 For would-be professionals in the equestrian industry we offer training courses covering the syllabi for the B.H.S. Stages I, II and III and the Preliminary Teaching Test. Students can opt to come for a year of study as a working pupil or we can construct tailor-made courses for those wishing to train intensively for a shorter period. To read more about these opportunities click here.